All Inclusive OR the Real Costa Rica? Before diving deeper into this subject, it should be noted that the purpose of this article is to shed light on to some of the common misconceptions about all inclusive resorts in Costa Rica. We work with all of these resorts and believe they are each good in their own regards for the right clientele. With that said, we also believe in presenting accurate information in an unbiased way. Chances are likely you will only visit Costa Rica once or twice, so our goal is to get it right the first time. Should you stay at an all inclusive resort in Costa Rica? This really depends on what you expect to receive out of your vacation. Some undoubtedly should. This holds particularly true for anybody that just wants a room at a nice resort with nearby beach access and plenty of food, drinks and relaxation. BUT, if you actually want to explore Costa Rica and see what all of the hype is about, you really should give this a little more consideration. The truth is, many people who think they should go to an all inclusive really should not. This can be a tough lesson when you show up at the resort and it’s too late to back out due to the strict cancellation policies many of these resorts have. Let’s take a look at some of the more important factors so you can make an informed decision. Is staying at an all inclusive resort safer than a non all inclusive hotel? Costa Rica is much different than other Latin American and Caribbean countries in regards to safety. In fact, it is actually one of the safest countries in the world to travel to. USA Today recently published an article which named Costa Rica in the top 10 safest countries in the world for women travelers. While it is a good idea to stay at a hotel with security, you certainly should not confine or limit yourself to an all inclusive resort for this reason. Will you save money by staying at an all inclusive resort? This is a tricky question, but an important one. The first thing to address is that the all inclusive resorts in Costa Rica serve buffet meals unless you upgrade to high end service packages, which can add hundreds of dollars to the price. Most resorts allow one menu dinner per 3 night stay in a resort theme restaurant, but these can be very difficult to obtain reservations at as they usually do not allow you to reserve until you check in to the hotel. Space in these restaurants is always limited. Meal prices in Costa Rica are relative to how you choose to eat. For example, you can eat at a typical soda (this is what small restaurants are called in Costa Rica) for as little as $5 - 7 for a traditional Costa Rican casado (rice, beans, salad, plantain and a meat) and natural fruit drink. Alternatively, if you eat at a hotel or resort, you can expect to pay anywhere from $8 – 20. Obviously this could go up if you were to order lobster or other expensive dishes, but this should give you a general idea of how much food costs (also keep in mind, you won’t find lobster on the buffet at any all inclusive resort). Drinks are a little more affordable than they are in the United States. A national beer at a restaurant or bar will cost between $1.50 - $3. A shot of national liquor will typically fetch around $3 - $4 and mixed drinks will usually range in price from $3 - $6. Obviously if you are at a swank establishment, these prices will likely be higher. All inclusive resorts in Costa Rica start at around $125 per person per night for a 3 star hotel in the rain season and go up from there. Most people travel during the high season months between December through April and June through August. Rates are typically higher during these months with rates starting around $150 per person, per night. The average non all inclusive 3 star ecolodge, hotel or resort will cost around $100 - 120 (total, not per person) per night in the low season and in the $135 - $150 range during the high season. The vast majority include breakfast. If you were to explore a little of the culture and eat at a local soda, you would pay around $6 for lunch. Then if you ate at the hotel that evening, you could expect to pay around $15. Say you wanted to add a couple sodas and bottled water ($6), a few beers ($7.50) and a couple mixed drinks ($10), the total for food and drinks would be approximately $45 per adult (a little over half that for kids). Therefore, if you were to stay at a nicer 3 star hotel during the high season, you would pay around $75 per person for the hotel and $45 each for food and beverages, totaling around $120 per person, per night. In the low season, this would drop to around $100 each. 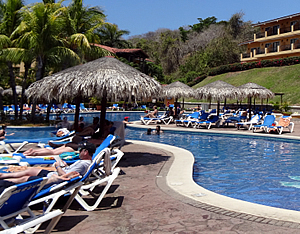 What should you expect from a Costa Rica all inclusive resort? All of the all inclusive resorts are located in northwest Guanacaste, which is the driest area of the country with little wildlife, no jungle, volcanoes, rafting or hot springs. While you will undoubtedly find photos of all of the aforementioned posted on their websites, it will require a 3 – 4 hour drive to access the country’s main attractions. So why would they post these things on their websites? The answer is simple; this is why the vast majority of people come to Costa Rica. The majority of all inclusive resorts in Costa Rica are isolated. Flamingo Beach Resort and Barcelo Langosta Resort are the only all inclusives located within walking distance to a town. The Westin Playa Conchal is located within a 10 minute drive to town and the rest are much more isolated. All but one of the all inclusive resorts in Costa Rica are multi-national corporate owned resorts. Therefore, if you have been to an Occidental, Riu, Westin, Hilton or Barcelo resort in another country, you should know exactly what to expect. The only difference worth mentioning is maintenance as the tropical climate can quickly take its toll on building materials. This holds particularly true with large resorts as the scale of maintenance is enormous. Therefore, rather than fixing things as they begin to ware; most of these resorts go through complete overhauls every 5 – 7 years. If you happen to go towards the end of one of these cycles, it may seem run down. With that said, it is always a good idea to check out recent reviews before reserving your stay. About half of the all inclusive resorts in Costa Rica have direct beach access. The others are built on the sides of hills. This is due to the lay of the land as well as strict building codes along the coasts. Most of the resorts have shuttles that continuously cruise around the property so you do not have to walk up the hills. The exceptions to this are Flamingo Beach Resort, Barcelo Langosta Resort, Barcelo Tambor Resort, Westin Playa Conchal, Dreams Resort, and the Riu Resorts, which are all located within a flat walk to the beach. 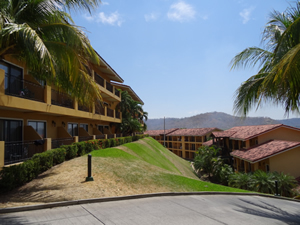 The Occidental Grand Papagayo, Occidental Allegro Papagayo, Hilton Papagayo, Condovac la Costa and Villas Sol Resort are all located on hillsides. The Hilton Central Pacific Resort (Puntarenas) is located within a flat walk to the beach, but it is not recommended to swim there. 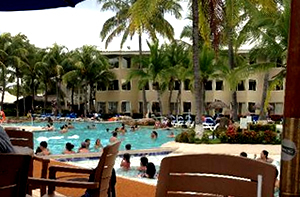 Service is generally consistently good at Flamingo Beach Resort and Westin Playa Conchal. 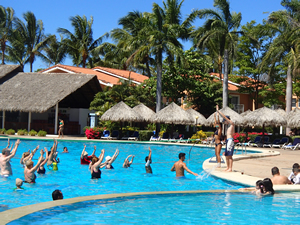 The Barcelo Langosta Resort usually provides good service, but at times can feel a little too corporate. The others can be inconsistent at best. Again, it is a good idea to check out recent reviews. What’s in it for us? Why spend the time writing this? It’s actually easier work and we earn more money when clients go to all inclusive resorts. Our income is based on wholesale prices which are a percentage lower than retail prices. It’s really simple economics. The more you spend, the more we earn and all inclusive resorts cost more. BUT, there is a much larger picture. You can go to an all inclusive resort anywhere. You can only experience the real Costa Rica here and for most, it will be a much more rewarding and memorable experience. In the end, if you trust us and choose the real Costa Rica, you are much more likely to tell all of your friends about us. It’s not all about business though. We really love this country and love sharing it with people like you. Our clients that take that leap of faith often turn into friends and that is simply not possible with the cookie cutter all inclusive model. If you only want to relax, eat, sleep and drink, then you should go to an all inclusive resort. If you want to see and experience the real Costa Rica, you should not go to an all inclusive. If you want a mix of adventure and wildlife, but also want to completely unwind without a care in the world, then you should combine the two. Many of our clients do this and find it to be a good compromise. Click here to start planning your perfect Costa Rica vacation now!